The wide range of possible benefits underscores the importance of passing a bill that provides a pathway to permanent legal status, without adding a raft of draconian measures that target DACA recipients and their families. 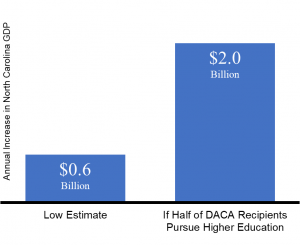 The greatest economic benefits will occur if DACA recipients are free to invest in their educations and pursue upwardly-mobile careers, which is what the Dream Act is designed to do. Any efforts to pair DACA status with greater surveillance of immigrant communities, new provisions that would make it easier to deport recipients and their families, or other mechanisms designed to drive immigrant communities further into the shadows will only prevent DACA recipients and the state’s economy from reaping the full benefit of the law. Economists from across the political spectrum agree that ending DACA would hurt North Carolina’s economy. As we reported previously, the Cato Foundation predicts that ending DACA could cost North Carolina $7.8 billion over the next decade, a figure that is within the range estimated by the Center for American Progress. State and local government coffers would also take a hit if Congress fails to pass the Dream Act, or another effective solution. The Institute for Taxation and Economic Policy estimates that current DACA recipients pay almost $58 million in state and local taxes, contributions which could grow to $78 million if the Dream Act were passed, the equivalent of 1,600 teacher positions in North Carolina. Particularly given that we have already invested in educating many of the young people eligible for DACA, turning down their contributions to the fiscal future of the state would be pure folly. Thus far, Congress has failed to move legislation that would actually avert these dire outcomes for DACAmented individuals, their families, and our state. The Trump Administration created an artificial crisis by ending DACA without a replacement plan, so its time for Congress to step up and prevent the breakup of families and the breakdown of major portions of North Carolina’s economy. (To receive updates and information on federal immigration reform, click here and select “Immigrants’ Rights” in the list of options).